The Grand Prix of Japan at Sukuza has often been a nexus point for the Formula 1 Drivers Championship thanks to its late season date. Thrilling with the famous deciding fight in the Prost/Senna battles of 1989 and 1990, the 2011 Formula 1 season's top driver Sebastian Vettel intends to celebrate clinching his second championship simply by scoring 1 point more than Jenson Button. Starting Sunday's Japanese Grand Prix, the reigning champion displayed he had no plans of playing it safe. In a last second qualifying run, Sebastian Vettel ripped off a flying fastest lap to claim pole position. Accustomed to the pace he has maintained all season in the Red Bull-Renault, Sebastian Vettel launched aggressively as the lights went out to start the Japanese Grand Prix. Racing against the front row-starting McLaren-Mercedes, Vettel feverishly held off the Jenson Button almost directing the second-place vehicle onto the grass. Button, requiring to slow down into turn 1, would also lose a position to teammate Lewis Hamilton as he exited turn 1 in 3rd place. Vettel earned some criticism from the McLaren team but was quickly defused as the race progressed. With a race going textbook for Sebastian Vettel and the Red Bull-Renault, the fight 2nd to 4th place would see Jenson Button reclaim his original spot from Lewis Hamilton on lap 8just before the 2008 World Champion pitted. Hamilton stopped his McLaren-Mercedes to the attention of crew early due to a recorded tire puncture. As the McLaren pit crew came to the aid of Hamilton, the race mechanics would be elevated to heroic. Pitting on lap 21, Jenson Button came to the attention of his crew members who performed a lightning fast pit stop compared to Vettel's Red Bull Racing mechanics. Gaining sizable track position, Button came out of the pits in front of the previously-pitted car of Sebastian Vettel. Exiting in 4th place overall at the lap 22 point in the Japanese Grand Prix, Jenson Button progressed to the lead. With a safety car period slowing the Grand Prix of Japan as a result of debris (namely the carbon fiber pieces landing on track after Mark Webber's Red Bull-Renault made contact with the Mercedes GP car's Michael Schumacher in the 130R area of the Suzuka track. Off the restart, Jenson Button continued to pull away from Sebastian Vettel while the Ferrari of Fernando Alonso managed to fish around the Red Bull for an ultimate second place finish. Jenson Button would hold on to win the 2011 Japanese Grand Prix for what was an big victory for the McLaren. Button had just signed a contract renewal with the McLaren Formula 1 team for several more season. The country of Japan has also been desribed as special to Jenson Button by post race comments. "It’s such an emotional victory for me: there’s so much history at this circuit, and the crowd here has been amazing, this is second only to a home victory for me." said Button. The British driver is personally connected to the country highlighted by a special race helmet he has worn at Monaco and again at this Japanese Grand Prix. That Jenson Button helmet will be auctioned off in the near future in support of the country of Japan currently rebuilding from the natural disaster earlier this year. 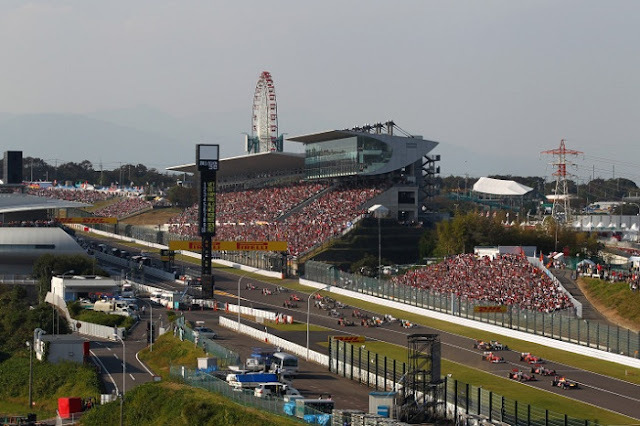 Michael Schumacher finished 6th in the Japanese Grand Prix but enjoyed one of the more momentous runs at Sukuza. In the latter 1/3 distance in the event, Schumacher's Mercedes GP MGP W02 race car led before a necessary pit stop. “I’m very happy with what we achieved in Suzuka today as we maximised our potential of the car, and managed to put in a good race." said 7-time Formula 1 champion Schumacher. While Michael Schumacher's teammate Nico Rosberg did not enjoy a front-running sprint in the grand prix, the young German did accomplish a hard-fought feat. Unable to log a lap in qualifying Saturday at Suzuka, Rosberg's Mercedes GP car was only granted a rear field starting spot after Formula 1 stewards permitted the team to run the Japanese Grand Prix. By lap 25, Nico Rosberg and his crew worked the car up to 13th place. At the end, a 10th place position and a single Formula 1 series point was earned by Rosberg. After the race though, the man of the hour was the acclaimed 2011 Formula 1 World Champion Sebastian Vettel. 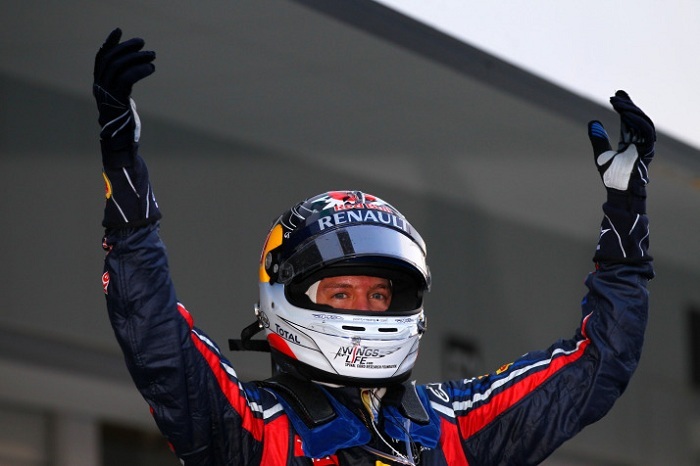 Needing only a single point, Vettel displayed the same grand prix win-contending performance powerthe Red Bull-Renault driver plans in completing this near dream season. Finishing 3rd and on podium, Vettel was ecstatic about his 2nd straight championship by charging towards his Red Bull Racing crew members in celebration. Vettel clinches the Formula 1 championship with 4 races remaining in the 2011 season. Sebastian Vettel joins active drivers Fernando Alonso and Michael Schumacher as multiple time champions in Formula 1. 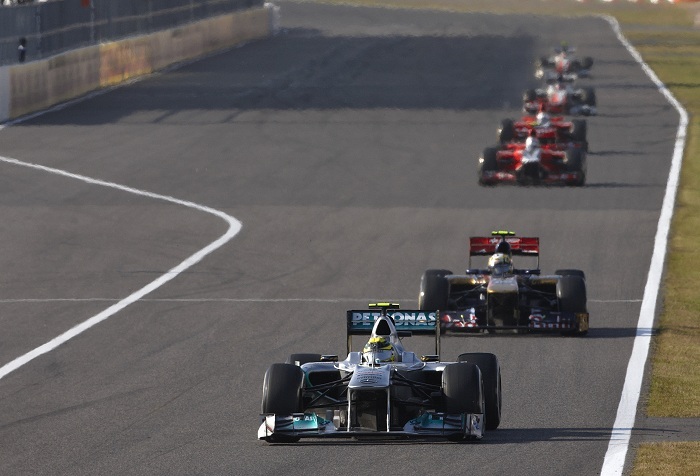 Continuing with the late year Asian tour for the Formula 1 series, teams prepare for the Korean Grand Prix schedule in one week's time (October 16th).